Roughly 25 to 50 million metric tons of electronic waste, also known as e-waste, is thrown away every year. Outdated or non-functioning televisions, computers, cell phones, and various energy sources are disposed in landfills, and although they only represent 2 percent of waste in American landfills they account for 70 percent of toxic waste. Disposed electronics threaten the safety of air and water supplies when discarded improperly. Eroded electronic batteries from products such as laptops are known to leak and contaminate groundwater. Burning plastic components of equipment releases cancer-causing dioxins. Materials like lead and mercury, which cause permanent brain and kidney damage, leak out of landfills and into surrounding soil and groundwater. As it would seem, environmental hazards caused by improper disposal of e-waste can only be alleviated by recycling electronics. Unfortunately, 10 to 16 percent of all recycled electronics are exported to developing or industrializing countries such as China, India, Nigeria, and Pakistan, where they are burned or dumped in rivers. This percentage of recycled electronics--which only constitute 12.5 percent of all discarded electronic products--are not properly disposed; instead, they are soaked in acid and release barium, beryllium, cadmium, mercury, and other hazardous toxins into the environment. 1. 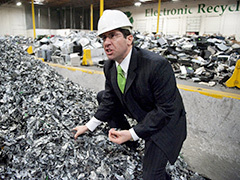 Find an Electronics Recycling Center. 2. Verify that Your Recycling Center is an E-Steward. By ensuring that your closest electronic recycling center participates in the E-Stewards Program, you will not send electronics to developing countries and contribute to e-waste. Posted on May 26th under Pollution Reduction.